Wednesday the 18th of December, just another quiet day in Hobart, maybe too quiet. Oh how that was about to change. There was an air of hype and anticipation at the Brisbane Hotel. More rare music t-shirts than two drummers can poke sticks at. The support bands kept us entertained until we broke into the main bar, ready and waiting for what seemed to be an eternity. The crowd were on edge and the mosh pit was brewing. Two drum kits were staring us all down. A remix of Black Sabbath's Sweet Leaf blasted through the right half of the speakers. The left stack were down!!! The roadies were on it. Technical difficulties aside, nothing could spoil the entrance of the Melvins. Cody (sporting an impressive handlebar moustache) and Dale kicked robed Buzz and turbaned Jared into a ridiculously heavy Hag Me. The crowd went crazy. The legend that is Buzz, with his electrified mass of hair did little more than own the stage. Once again, Dale and Cody intro-ed us into the new The War on Wisdom followed by We Are Doomed and Sweet Willie. The crowd responded, loving every minute of the show. 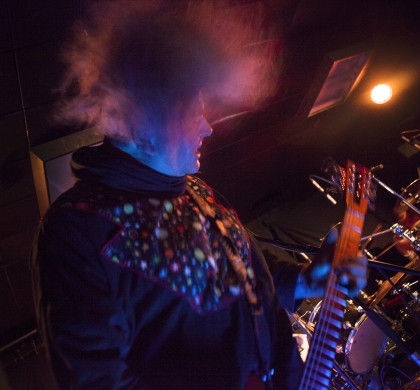 Not once did the Melvins let up as they fed us all 30 years of music history. It was all there for us to see. Chunky ridden grooves, harmonies, drumming mayhem taunted the beast that is the mosh pit, making everyone work full time to hold their spot. Bodies flying everywhere. The massive new City Dump charged the masses then The Water Glass lead the sweaty mass to and fro some vocals with the band, then straight into Evil New War God and Lysol, Buzz and Jared leaving Dale and Cody to settle the unrelenting crowd with a huge dose of drums. Ears were left ringing, throats were hoarse, minds were blown, we all left as different people! Hobart will never be the same.